Children who attend grammar schools make more progress than they otherwise would, while children who attend non-selective schools in selective areas (secondary moderns) make less progress than they otherwise would. 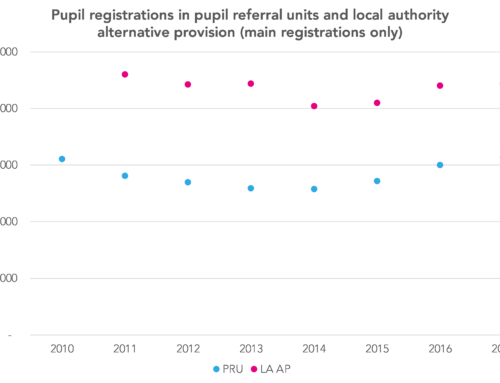 In any selective area, a majority of children will attend non-selective schools – the gains of those who attend grammar schools have to be considered alongside the reduced progress of those who do not. 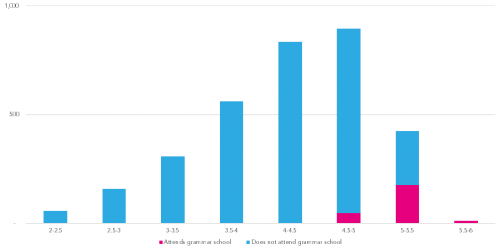 In fully selective areas, grammar schools attract the most experienced teachers. While the relationship between teacher experience and quality is complex, in general grammar schools benefit from having more staff with more experience. For more on this point, see our post Inequalities in access to teachers in selective schooling areas. In existing grammar school areas, the proportion of children eligible for free school meals (a commonly-used indicator of deprivation) who attend grammar school is well below that of children who are not eligible for free school meals. There are two factors at play here. One is that a child who is FSM-eligible is less likely to attend grammar school than a child with comparable Key Stage 2 results who is not FSM-eligible. With political will, this would be a relatively easy issue to address. Poorer children have markedly lower attainment at age 11, for a number of reasons, however (an issue that needs addressing in its own right). To have a dramatic impact on the number of poor children attending grammar schools, entry requirements for these children would need to be loosened to such an extent that many people would no longer recognise the schools as being selective. In existing selective areas, there is a greater disparity in education performance between children from poor neighbourhoods, and children from wealthier neighbourhoods (visible as a steeper line in the chart shown here). 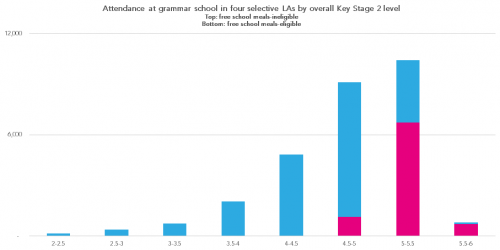 For the reasons set out above, any system of grammar schools is likely to replicate this effect to some extent at least. 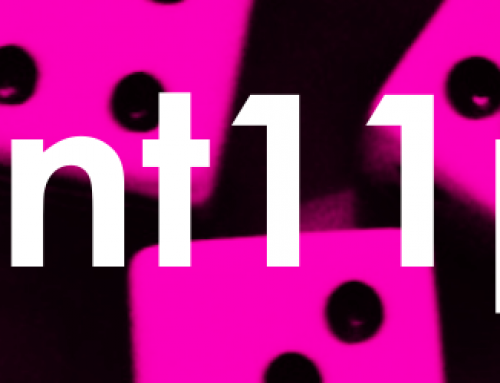 Currently, areas with age-11 selection fail the poorest children. Based on current experience, Education Datalab is concerned that non-selective schools in areas where selective schools open will always lose out, with less access to the most experienced teachers. 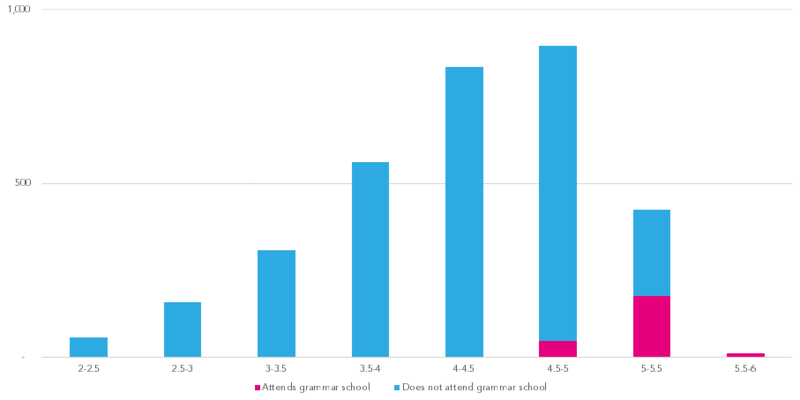 Education Datalab is also concerned that, despite government intentions to the contrary, in practice the poorest children will continue to be less likely to attend grammar schools. As a result, the Department for Education should concentrate on ensuring that all children receive a great education, regardless of their attainment at age 11. This research is also available as a three-page briefing note here. 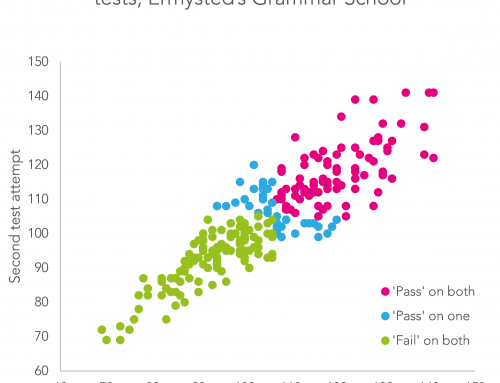 To read the rest of Datalab’s research on grammar schools, check out our other blogposts on the subject here.